"Gayla Marie Lovejoy, Westbrook College, Class of 1976"
Westbrook College student Gayla Marie Lovejoy, Class of 1976, was a Medical Technology major and a Day Hop. 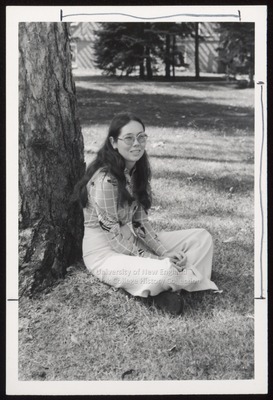 For her senior class candid photo, which appeared in the 1976 Tower Yearbook, she wore bell-bottom slacks with a long-sleeve blouse. Her hair was long, parted in the middle and pulled back behind her ears. Gayla sits cross legged in the sun at the base of a tree on the Campus Green.